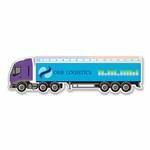 Branded rulers are an ideal giveaway for a number of different market segments. They can be found in schools, colleges and universities as well as businesses and organisations. 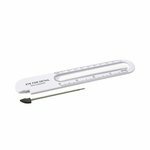 In our experience plastic rulers are one of the longest lasting promotional gifts purely because people find them so useful that they tend to keep them in their drawers or near to hand for use as and when needed. 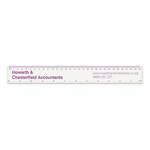 We can supply traditional 6inch and 12inch rulers as well a engineering rulers and bespoke designs. Please do contact us if you cannot find the ruler you are looking for and we will be able to source it through our supply chain. 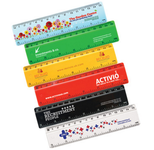 Branded plastic rulers are a must have promotional giveaway and one that you should consider using in your marketing. 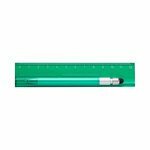 We supply a wide range of rulers whether you are looking for a 6inch/15cm or 12inch/30cm standard ruler or shaped or specialist engineering rule. As well as solid and frosted plastics we can also supply wooden rulers as well as novelty versions incorporating a gadget like a calculator or even a super bendy rubber version. One of the best thing about a branded ruler is that it is kept and often for many years. That is because a plastic ruler (especially a clear view one) is so useful to have around making them ideal for businesses and organisations including schools, colleges and universities. Rulers are very functional devices and we often consider them for one of two purposes. Firstly drawing straight lines and secondly measuring the distance between two points. This makes them ideal for any office, engineering or educational environment where they can be used for general drawing, technical drawing and geometry. In a marketing office, rules provide a straight edge from which to proof copy or view a design to ensure it is to size and scale. Specific industries may have their own form, such as an engineer rule or a carpenters rule. Rulers are a relatively recent invention with archaeologists dating the earliest known to around 2650BC made from a copper alloy. Later ones from around 1500BC were made from ivory and found in the Indus Valley Civilisation. The problem with rulers from this period is that they had to be made to a specific length and there was little way to calibrate them. These rulers were more functional and helped to standardise measurement units from what humans had used in general previously based on body parts such as a foot or hand; a practice that lasted over 4,000 years and in trust is still to be found today as a rough guide. The first folding one was invented by Anton Ullrich. The first flexible plastic rule was made in 1902. Branded rulers come in several different materials including plastic, recycled plastics (Eco rulers), wood and metal. The standard lengths are 15cm and 30cm (corresponding to 6inches and 12inches) but we can also source through our supply chain 45cm versions, yardsticks and meter rules. The quality of a rule will often depend on the price and material used to make it. Whatever the material, it should last a long time and give years of service. Wooden: the wood used for this type of rule is typically inexpensive, lightweight but reasonably hard wearing. Imprints can be screen printed or embossed into the wood so that they are permanent. The wood itself will be softer than metal or a plastic and care should to be taken to ensure the edges are not damaged. Plastic: the plastic used can be fairy inexpensive and either brittle or made to be shatterproof to prevent any potential damage. Thicker more durable plastic can also sometimes be used but in general a plastic one will be durable and flexible with some bending. On a plastic ruler the rule part will be made as part of the mould and an imprint applied using screen printing. The plastics can also range in colour from solid and frosted to transparent or translucent. Eco friendly plastic can be made from recycled or reclaimed plastics and can offer an environmentally friendly alternative type of product. Metal: the metal will be an allow and can provide more long-term durability if used for as a cutting edge as metal rulers tend not to be damaged to the degree wooden or plastic rules can be. Metal rules tend to be heavier than wood or plastic. The edge rule may be applied using photochemical machining or etching. Some metal shapes are possible including triangular tubes rather than flat rules. Types of metal rule include carbon, stainless steel and aluminium. High-carbon steel metal rules are often chrome plated and resistant to corrosion. They typically have a satin finish and will have their rule applied using photo etching or be precision machined. Stainless steel rules will be heavier and will not corrode. Stainless steel rules are less expensive than high-carbon steel and are naturally corrosion resistant. They can be deformed through mishandling including extreme bending leading to a misshape and damage to their edges. Aluminium rules are by their nature lightweight and the aluminium is anti-corrosive. Care has to be taken if the edge is used for cutting and/or protection provided from damage to the edges as aluminium is a fairly soft metal. Out of all the materials, plastic remains the most popular for rulers and more clients are adding an eco-element by requesting ones made from recycled plastics to be more environmentally friendly. Can you supply eco-friendly rulers? To be environmentally friendly the ruler must be made from sustainable or recycled materials. 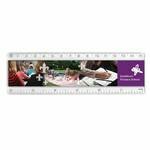 We can supply rulers made from sustainable managed woodlands and also recycled plastic materials. Why are rulers one of the longest kept giveaways? Rulers are one of those really useful giveaways that people tend to keep in their desk drawers and use as required, for measuring, cutting or simply to help proof-read text. 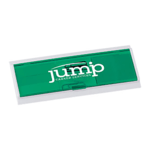 A clear view plastic ruler is one of the most common stationery items we supply to our clients. Do you supply engineering rulers? We can supply architects and engineering rulers with the required engineering marks on them. These are a sourced giveaway from our supply chain.